Posted on June 28, 2017, in Card Samples, Challenge Entries, Debbie's Challenge Entries, Oscar's (Deb's) Card Samples and tagged Coffee, Coffee Lovers bloghop, Reminisce, washi tape. Bookmark the permalink. 9 Comments. Gorgeous card design, can see why this specific washi is your favourite! Yes, the way you described washi tape is exactly how I feel! This card makes great use of the washi and that sentiment is just too funny. I love it! I would hoard that washi, too – it is fabulous!!! Awesome card. LOL…you crack me up…but I’m there right with you…I have a ginormous drawer FULL of washi. I’ve seen that washi pop up on my FB feed…I’ve started carts, several times….gah, may need to just buy them. A crafter can never just buy one roll of the stuff, right? Your card is absolutely awesome. 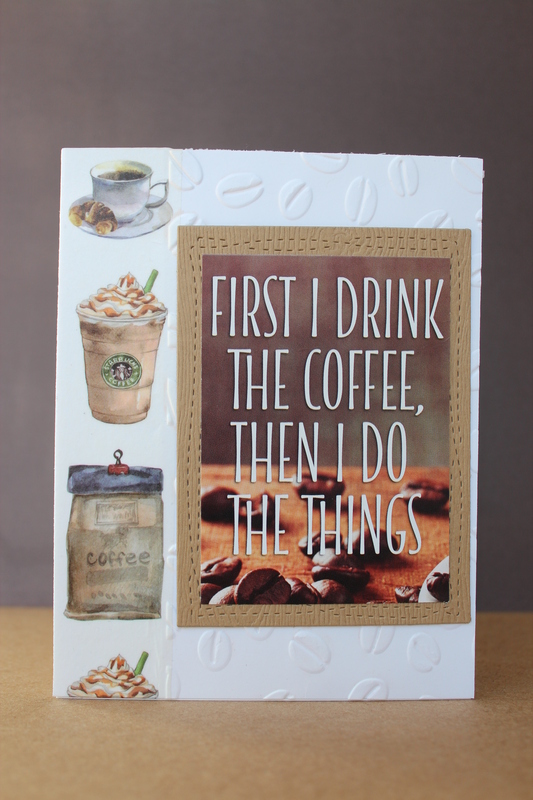 Wonderful coffee designed card. I like the embossing folder you used.